Spread out on the back table of one of my favorite shops was a new shipment of wood blocks, leaves, fish, paisleys, elephants, stacked and huddled together in a critical mass of delectable designs, pristine in their newness. Judy Gula, the owner of Artistic Artifacts in Alexandria, Virginia, continued sorting and pricing while I admired them. 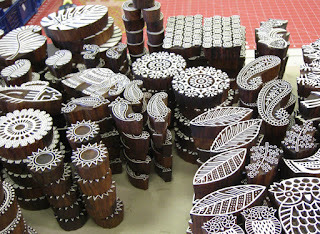 Hand carved in India, they are worthy of objet d'art status. Many people collect and display them in groups. They are versatile tools. Stamp them on paper or fabric using paint, ink or thickened dyes, press them into polymer clay, paper clay or porcelain. Leave them face up and make rubbings. The carvers in India would surely be pleased to see what we do with their blocks. 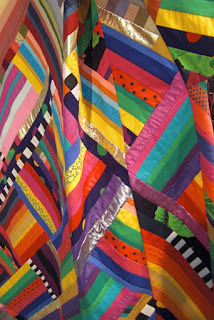 Check them out at http://www.artisticartifacts.com/category/block.html or see them in person when Judy is at a show. Roses and chocolates will always reign supreme on Valentine's Day, but indulgent desserts are almost as popular. 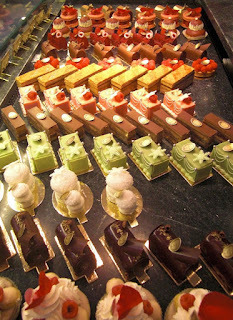 I am in awe of the skill and artistry to be found in many restaurants and patisseries. Each dessert promises deliciousness through the basic design principles of shape, color and texture. They are edible assemblages. 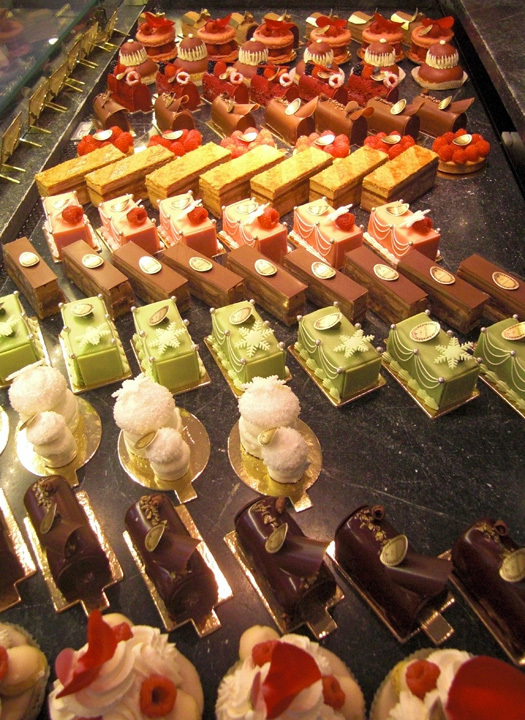 The desserts at the New York branch of Laduree are especially beautiful. Even the way they are placed in the display case is important. They stand at angles, like starlets posing on the red carpet. Their presence in multiples sets up a rhythm and a pattern, making them almost as wonderful to look at as to eat. Almost. 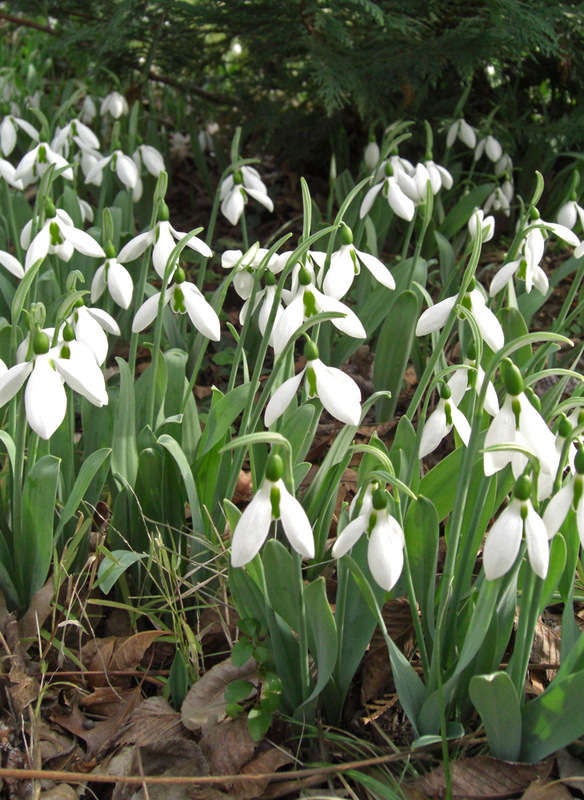 Snowdrops have appeared, pushing up out of the brittle brown leaves in my neighbor's side yard. I crouched down to admire them. Their little heads are bent, but they don't look downcast or embarrassed. They look determined, like a crowd of commuters marching off to work, headed into a cold wind. Each one wears a snug green cap and a tiny mark that looks a lot like a green version of the pink breast cancer awareness ribbon that we see so often. What is their green ribbon cause? Maybe only to give us a moment of unexpected joy and to remind us that eventually it will be spring.